In a first for Alton Model Railway Group American Section, we have had a layout featured in a magazine – Pine Bluffs Freight Yard was featured in the February 2015 issue of Continental Modeller. With images by the magazine, and text by Group member Roger Joel, the Freight Yard featured over an 8 page spread, and includes full and close-up images, descriptions of the modular approach, plans and even an extract from the ‘Pine Bluffs Gazette’. The article is intended to be the first of 3, with each focusing on a different module of the full Pine Bluffs and Red Dot Mine layout, plus background on the layout, stock, modelling, operation and more. 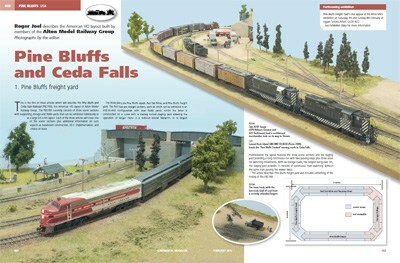 The second part, about Pine Bluffs Depot, and the third, about Red Dot Mine, will feature in future editions during 2017, after the full layouts debut at 2016’s Taunton exhibition. Regarded as essential reading for every enthusiast who models the different railways of the world. Each month it shows you how to reproduce foreign railway scenes perfectly and is filled with regular tips & articles intended to inspire beginners and experts alike. Filled with many exciting layouts including photographs, illustrations and plans and also boasts a huge range of display advertisements for those seeking to purchase further model equipment. Site ©Copyright 2016 Alton Model Railway Group. Site designed and maintained by Bureau14 Designs.